Aesthetix Romulus review | What Hi-Fi? Aesthetix is one of the brightest stars of high-end amplification. We’ve loved every single piece of kit we’ve heard from this American brand, but still approached its first foray into the digital domain with a sense of trepidation. We needn’t have worried. While not flawless, the Romulus CD player is a great piece of kit. It’s apparent from the first few seconds of listening. Our usual practice is to let test equipment warm up overnight before starting serious listening. Our review sample wasn’t new, so running-in wasn’t an issue. We normally don’t take much notice of the sound at this point, apart from making sure everything is working properly. The Aesthetix had other ideas. The first few bars of Eminem’s Bad Guy are enough to get us hooked. This recording can easily sound hard and thin, but that isn’t the case here. The Romulus delivers sound with a wonderful sense of space and ease. And detail? There’s loads, as the player uncovers subtleties with considerable skill. At this point we’re impressed, but we leave the player on repeat and come back to listen the following day. We wonder how the sound will change once the circuitry settles at operating temperature. The answer? A fair bit, all of it good. Listening to the Eminem track again, the presentation proves even clearer and more fluid. There are gains in transparency and top-end sweetness. Scale improves too. The Romulus does a pretty good job at tracking rhythms and communicating the aggression in the recording. There’s an element of rounding off the edges, though, which makes recordings seem a little easier on the ear than they should be. If you’re a rock or hip-hop fan, that may be an issue, but for the most part this Aesthetix delivers enough bite. Switch to Van Morrison’s Moondance and the Romulus sounds right at home. It captures the jaunty feel of the song brilliantly, rendering that lovely bassline with real dexterity. Tonally, things edge towards richness, but not enough to jar. Instead, the presentation is smooth yet still entertaining. It’s a balance that has become something of a trademark for the company’s products. The Romulus isn’t just a CD player, either. It’s equipped with digital inputs too, as is becoming common. There’s the usual option of USB, optical and coax, and the less-common AES/EBU connection too. The USB can be switched between Class 1.0 and 2.0 modes at the press of a little button on the rear panel. Using Class 2.0 – as we did for most of our test – extends the input capability to 24bit/192kHz high-res music files. Macs with OS X version 10.6.4 or higher will work right away, but if you have a PC you’ll need dedicated software drivers. USB Class 1.0 should work with most computers as standard but limits the input data streams to a 96kHz sampling rate. Regardless of mode, the USB input works asynchronously – so the DAC, rather than the computer connected to it, has control of information flow – which usually bodes well for sound quality. We play a range of music from our MacBook (which runs the Pure Music media-playing software) with really good results. There’s the same large-scale, spacious presentation that we hear when playing CDs, and similar levels of resolution. 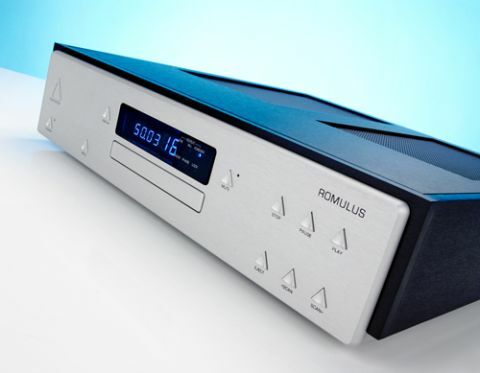 We’re impressed by the Romulus’s refinement and its ability to make low bitrate files listenable – there’s much to be said for such a forgiving attitude towards recordings. But, give it something really well-recorded like a CD rip of Nick Cave’s Push the Sky Away or a 24-bit/192kHz rendition of Mahler’s Symphony No.4 and it shines. Comparing the Aesthetix to a top-class, stand-alone high-end DAC such as Chord’s QBD 76 is interesting. The Chord certainly shows that more timing precision is available and delivers dynamic contrasts in a more forceful manner. It even digs up a touch more detail, but the Aesthetix counters with its more spacious presentation, a nicely layered sound stage and a much more forgiving attitude. Moving away from sound, there’s much to be impressed with here. Build quality is terrific; as it has been with all Aesthetix products we’ve seen. The unit’s aluminium casework feels solid and it’s all finished to a high standard. If we’re being picky, those distinctive triangular buttons on the front panel feel imprecise to use. We’d like a slicker drawer operation too: it feels no classier than many a budget player. The same thing can be said about the remote handset. Take a look inside and you will be greeted by neatly laid-out circuit boards. It’s no surprise to see valves used in the analogue stages (after all that is what the brand is known for) and we’re impressed by the high-quality internal components. As is usual for a product at this level, attention is given to preventing damaging interactions between the digital and analogue sections. This extends to the TEAC-sourced transport, which is enclosed in a Faraday cage to isolate it electrically from other parts of the player. The power supply is suitably elaborate and makes use of three transformers: one for analogue, the second for digital and the third for the control circuitry. If you fancy having a stripped-out system, you can even connect the Romulus directly to a power amplifier or a pair of active speakers. To do this you’ll need to specify a version with a built-in volume control (our review sample didn’t come with one), which adds another £950 to the price. That’s a large chunk of money, but does mean you won’t need to stump up for an even pricier dedicated pre-amp. The Romulus is a talented machine. It’s a very fine CD player and a talented unit if used as a DAC. If its refined, yet still entertaining, approach to playing music appeals, dive right in – and enjoy a smooth and elegant sound.